In an earlier article of mine, we took an in depth look at cardiovascular training and the many benefits of it. You can click here to take another look at that article. Today we are going to take a look at some of the various machines that can help you with your cardiovascular training goals. Now-a-days cardiovascular machines are starting to come in all shapes and sizes. Because cardio machines come in such a variety today, it is really hard to pick an overall best machine. I think a best overall cardio machine will depend mostly on an individual’s needs and the ability of the machine to be useful to a person’s goal. We will take a brief look at a few machines, describe them a little and then rate their ability. When we rate their ability we will look at two things their ability to burn body fat and an often overlooked ability to help build muscle. Here are some Cardio machines that may aid in your fitness goals. Treadmills are for the most basic impact exercise walking, jogging and running. Every quality treadmill has the ability to change the speed and incline (level of hill). Treadmills usually have safety features such as an auto stop switch and side handles to make sure you don't kill yourself. Another feature of the best treadmills is a remote heart rate monitor. It is not convenient to put your hands on the hand heart rate monitors when you running if you are serious about your exercise intensity. The best treadmills allow you to put a strap around your sternum which will send your heart rate to the treadmill by remote. Exercise Tip: If you do not like running walking on the treadmill can be just as effective for burning calories, fat and cardiovascular effect. The key is to set the treadmill at a significant incline. Working against gravity will increase difficulty and caloric expenditure. Do not pull on the handles when you have an incline. If you grab the handles it completely defeats the purpose of the incline. The calories burned meter on the machine will not be accurate also. If you have to hold on for dear life you should probably slow down the machine. 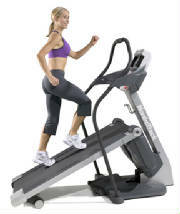 Inclined Trainers are usually just treadmills with the ability to incline to different degrees of height. Usually with the inclined trainers, they will be able to increase their height beyond the normal 15% of a regular treadmill. Some of these pieces of equipment can elevate all the way up to a 45-50% incline. With a much higher incline level you can burn the same amount of calories with much less effort. This is due to the fact working on a vertical plane of motion is much harder than working on a horizontal plane of motion. Although how many calories you burn is still based on the effort you put in, with Inclined Trainers equal amounts of effort will actually burn more calories than non inclined trainers. Another bonus feature of the Inclined Trainer is the workload it places on the glutes and hamstrings. If you really want to firm your glutes and hams the Inclined Trainer is for you. Exercise Tip: If you do not like running walking on the Inclined Trainer can be just as effective for burning calories, fat and cardiovascular effect. The key is to set the Trainer at a significant incline. Working against gravity will increase difficulty and caloric expenditure. Do not pull on the handles when you have an incline. If you grab the handles it completely defeats the purpose of the incline because you’re resting your bodyweight on the handles. The calories burned meter on the machine will not be accurate also. If you have to hold on for dear life you should probably slow down the machine because you are not accurately working. 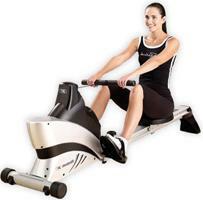 Stairmaster is actually a brand of stair stepper machines which predominantly known as Stairmasters now. The motion of a Stairmaster is similar to climbing up steps, but your body weight is actually pushing the steps down. If the difficulty of the Stairmaster is increased, the steps will fall faster which will cause you to step faster. On a Stairmaster you are working directly against gravity and your body weight. Any time a cardio exercise has a vertical component it will be more difficult than horizontal only activities. Stairmasters have been known to be hard on the knees. If you have any major muscle imbalances and posture problems, the Stairmaster is probably not your best cardio machine. Exercise Tips: Like most of the best cardio machines it is better for you to not hold onto the handles for dear life. The handles are for balance. If you need to support your body weight with the Stairmaster you should lower the intensity level. To get the most effective workout on a Stairmaster use an interval program. Which most cardio exercises on machines, the interval programs will allow you to burn the most calories a shorter amount of time. Interval programs are great because they work you aerobic and anaerobic systems together which has a significant effect on your metabolism. Wave Machines are sometimes nicknames the "Ice Skating Machine". The motion of the Wave machine looks very similar to a person that is speed skating. Wave Machines are the new "wave" in cardio equipment. Wave machines are great because they move on both vertical and horizontal planes of motion. The machine moves from side to side and also moves up and down when going side to side. The multiple plane work makes the Wave a great calorie burner. The lateral motion is great for the hips creating balance. This machine will work your hips like no other piece of cardio equipment. The up and down motion is great for the glutes, hams, and stabilizer muscles. This machine does take some getting used to so I would say it is a little more for advanced trainers. Most beginners find the Wave a little more difficult because of all the movement going on at once. Beginners should use the handles on the side until they develop better balance. The key is not to overuse the handles. More advanced trainers can use the Wave with little assistance from the side handles. Exercise Tips: Like most of the best cardio machines it is better for you to not hold onto the handles for dear life. The handles are for balance. If you need to support your body weight with the Wave you should lower the intensity level. For most beginners I recommend splitting your time between the Wave and another machine of your choosing until you build up enough stamina for a full Wave workout. Stepmills or Stairmills are like the escalators from hell. It is just like you are stepping up your local stadium steps, except they are never ending. Stepmills are not for the beginner. Even at very low settings Stepmills get your heart rate up very quickly. When you increase the difficulty level, the escalator goes faster. Something else to take note of is the steps are pretty narrow. If you have feet over size 12 it may be awkward to exercise on the Stepmill which is definitely one of the best cardio machines to get your heart rate up and keep it up. Exercise Tips: Do not support your entire body weight with the handles. You should hold them for safety reasons but they are not to support your body weight which takes away from the exercise's effects. You can also step up sideways both ways on Stepmills. This is a great way to help functionally strengthen your legs stabilization mechanism, inner and outer thighs. Do not try this if you have any ligament problems in your knees. 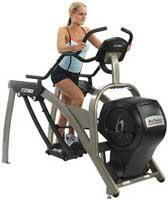 Elliptical machines are famous for non impact exercise. Non impact exercise means there is minimal compressive forces on your bones and joints. 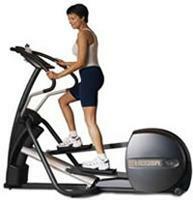 There are 2 main varieties of elliptical machines. One variety has handles which allow upper and lower body concurrent push-pull movement. The intensity is increased by adding resistance. The other variety does not have handles and usually allows the incline level of the foot rests to be adjusted as well as resistance. Exercise Tips: Do not make the elliptical machine your only source of cardio. If you perform only non impact exercise your bone mass and strength could suffer in the long term. To get the best workout on an elliptical machine with handles, set the resistance high so you have to use your arms as well as your legs. The Versa climber is one of the best cardio machines you have never heard of. If you do have a Versa climber in your local gym it is one of the least popular cardio machines and is probably collecting dust. The Versa climber is such a good cardio machine because you are climbing vertically which is directly against gravity. You also use your upper and lower body equally, which increases heart rate quickly. To increase the difficulty of the versa climber you can add more resistance. When you add more resistance you can push and pull which will not only work your muscles but give you a tremendous cardio workout. Exercise Tip: The versa climber is a tremendous cardio machine to use for interval training. At a decent intensity level, the Versa Climber can be tough even for 5 minutes. It is possibly the best cardio workout to alternate a few minutes on the Versa climber with a couple minutes on a stationary bike or any other cardio machine you can make a quick transition to. The treadclimber is the newest cardio machine to hit the market. Of course there was immediate claims of it being the "best cardio Exercise." The treadclimber is an awkward combination of a Stairmaster and treadmill. This cardio machine has independent treadmills which rise and lower every time your foot strikes. There is no running on the tread climber only walking which makes it a comfortable way to burn calories if you are significantly overweight. Exercise Tips: The up and down motion of each independent treadmill is not controlled by the machine but rather the strikes of your foot. Unless you want a wild, unproductive cardio workout make sure you plant each foot evenly and don't stomp. Like most cardio machines you should not support the majority of your body weight on the handles. Because of the awkwardness make sure you hold to the handles when you first try the tread climber. There are probably a million different models of stationary bikes. Stationary bikes are upright with no back rest. Every gym in the world has a few stationary bikes. The way to increase the intensity of a stationary bike is to increase the resistance of the pedals. Most stationary bikes have many different programs. In some programs increase the resistance on preset intervals and some depend on your heart rate. The programs which use your heart rate increase the resistance to keep you at your target heart rate. The machine usually determines your target heart rate for you from the information which you enter in before you start the program. Exercise Tip: Make sure you sit upright and do not slouch when using the stationary bike. If you work a job or live a lifestyle where you sit for many hours during the day, you should probably not use the stationary bike and use a standing machine. Your hip flexors are most likely tight which would cause posture problems if you overdo work on the stationary bike. Recumbent bikes are the lazy person's favorite cardio machine. If you make the trek to your local gym you will definitely see a few people read a magazine while they watch TV and talk on their cell phone on a recumbent bike. This does not have to be the case. Like any of the best cardio machines you can elevate your heart rate significantly on the recumbent bike but you have to have some kind of motivation. 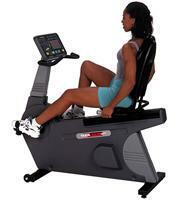 Exercise Tips: If you want to get the best cardio workout on a recumbent bike use one of the hill profiles. These are interval programs which raise the resistance for intervals. At the top of some hills you will want to quit because your legs burn so bad, but just as you are ready to quit, the interval will be over and you will be coasting again. Make sure you set up the distance to the pedals properly. Your legs should come to almost full extension but not locked. If the pedals are too close you will most likely burn out your leg muscles more than increase your heart rate. The rowing machine is the most underrated cardio machine in the gym. Most people do not understand the correct way to use rowing machines. Rowing machines are obviously the best cardio machines for simulating rowing but they are great for cardio as well if you know how to use them. Rowing machines are not meant to be a resistance exercise. When people improperly use them they are usually pull very hard with their arms and have bad form. The difference between rowing machines and all other cardio machines is you completely control how intense your session will be. The faster you go, the more intense your cardio workout will be. This is why rowing machines are not the most popular cardio machine, you must have motivation to get the full benefit from rowing machines. Exercise Tips: To get full cardio benefit of the rowing machine you should use one of the programs which is built on the little screen. These programs will show you intervals which allow you to pace yourself so you don't get burned out too quickly. The arc trainer is another non-impact cardio machine. They are the newest type of cardio machine in your local gym and are probably most popular. You step on two platforms and basically swing your legs back and forth in a similar fashion to the gazelle freestyle which has been a top selling home workout machine for years. The adjustable resistance as well as the speed which you choose to swing your legs back and forth in the scissor-like motion adjusts the intensity of your cardio workout. 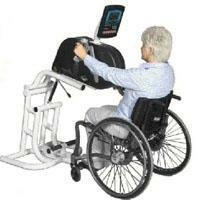 Exercise Tips: Non-impact machines are the best cardio machines for people with chronic joint problems. The arc trainer can get your heart rate up effectively without putting too much stress on your legs. Don't let the non-impact style cardio machine sabotage your results though. Make sure you work hard and keep your heart rate up higher than your target zone. If you are free of joint problems, make sure you use forms of impact exercise such as jogging to keep your bones strong and your bone mass at optimal levels. Hand ergometers or hand bikes are not anybody's favorite cardio machines. When you are forced to use a hand ergometer it usually means you either have a broken leg, sprained ankle, surgically repaired knee or are bound to a wheel chair. Hand ergometers can actually get your heart rate up faster than leg cardio machines because your arms are closer to your heart than your legs. Hand ergometers have been used often in research about heart rate response among other things. Exercise Tip: Think happy thoughts. The hand bike is not very fun and can be quite boring. Very few people choose to use the hand bike as a form of cardio. What are the Best Cardio Machines for Fat Burning? It has been said multiple times but any cardio machine can be used for fat burning. This does not mean that some machines are not better than others for fat burning. It means the effects of the best cardio machines depend on how you use them. Machines where you work on a vertical plane do seem to offer a slightly higher benefit due to you working against gravity. The best cardio machines such as Stepmill and Versa climber are no easy to cheat on. Even at a very basic level they are still challenging and help you raise your heart rate. Combining these factors makes machines where you work more on a vertical plane better cardio options for fat burning. Always choose a cardio machine that you enjoy. Yes this one sounds like a no brainer but honestly, if you don’t enjoy a piece of cardio equipment how often are you really going to do it. You may not be in love with any piece of cardio equipment but the goal is to choose one or two that you will want to do on a consistent enough basis that you can achieve your goal. Make sure the machine does not hurt you when you’re exercising. I am not talking about a machine that makes you sweat like a 110 degree day or one that puts a nice burn in your quads or glutes when you do it. I am talking about a machine that you choose that physically hurts your joints or bones because it is not suited to you or your physical capabilities. Some pieces of equipment like treadmills can often hurt some people’s knees due to impact stress. Know your physical abilities and then choose from there. Make sure the cardio machine is consistent with your goals. If your goal is better glutes and hamstrings you should not choose a piece of equipment that stresses mostly your upper body. Whatever your goal is your equipment choice should have the same goal. Does the machine give you a productive workout? Productivity is the key to success. If you choose a machine that is too easy you won’t achieve your goal because your not working hard enough. Conversely if you choose a machine that is too hard you also will not achieve your goal because you will not be able to complete your task. 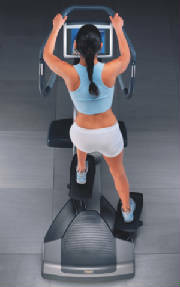 Machines like Stepmills and Versa Climbers tend to be for more advanced trainees. Often beginners will try these machines and give up rather quickly on them due to the degree of difficulty. Start off with a machine you feel will give you a decent workout on your level, as you become more advanced in your training you can always move on to a more advanced piece of equipment.